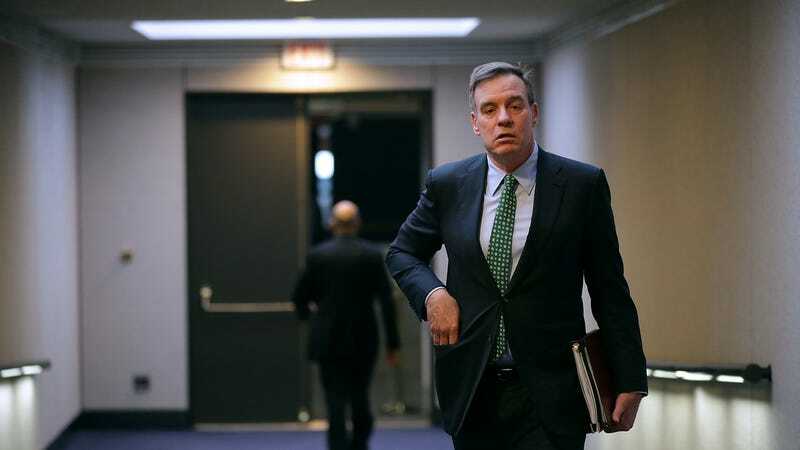 Senate Intelligence Committee ranking member Sen. Mark Warner (D-VA) arrives for a committee hearing in the Hart Senate Office Building on Capitol Hill March 21, 2018 in Washington, DC. In a speech on Friday, Democrat Mark Warner, vice chairman of Senate Intelligence Committee, presented what he called “a new cyber doctrine,” advocating not only for a hardening of America’s digital infrastructure but for an approach to cyberwarfare that doesn’t hinge solely on mirroring adversaries’ use of offensive tactics. The U.S. needs to increase its presence on the international stage, argues the Virginia senator, and play a central role in establishing common “rules and norms” for the invisible battlefield—or China and Russia will. Speaking at the Center for a New American Security, Warner advanced the idea that America’s cybersecurity is on the whole ineffectual; that its response to foreign adversaries is either too weak or too slow to matter; and that its vulnerabilities, in addition to past failures, are largely the result of existing in a state of complacency and overconfidence for decades. More specifically, he said, the U.S. has failed entirely to devise a substantive approach for mitigating an influx of information operations, in which private American citizens are chiefly the target. In recommendations offered later in his speech, Warner defined what he calls a “whole-of-society approach” to security, which relies partly on a self-regulating free press, but also “places limits on social media platforms.” Mark Zuckerberg, the only corporate officer named in the speech, is offered up as the quintessential security-illiterate executive, as Warner recalls how quickly Zuckerberg was to brush aside the notion his platform could influence global elections. Warner also presents the U.S. military and intelligence agencies as wholly unprepared for adversaries that hold a “radically different conception of information security,” one which is not focused entirely on the defense and infiltration of protected networks but relies evenly on the use of disinformation, sabotage, and manipulation of the press. Warner further describes how confidence in this “supposed superiority” has left Americans virtually defenseless against cyberattacks “at every level of our society,” listing off examples of state-sanctioned attacks on a myriad of critical industries—health, energy, and financial—as well as constant intrusions into federal networks and a drastic uptick in global ransomware and denial-of-service attacks. Circling back to private companies, Warner calls for consideration of a “software liability regime” aimed at nudging market forces toward increased security “across the entire product lifecycle.” Congress, he says, should explore the pros and cons of imposing “duty-of-care” responsibilities on app and device makers, suggesting that developers might ought to face statutory penalties for failing to uphold reasonable security practices. “We have no cyber committee,” Warner proclaims. Perhaps expectedly, Warner spends less time discussing the use of covert actions authorized under executive powers and instead seeks out solutions that would involve, as he puts it, “all of us,” meaning the government, including Congress, private companies and the American people.